The Expanded Dune-iverse: Hunters and Sandworms and Prequels, OH MY! These thoughts are SPOILER FREE until the warning. After recently completing my annual re-reading of Frank Herbert’s Dune series and compiling my list of memorable quotes, I was not quite ready to leave that universe behind. I wanted more following the cliffhanger ending to Chapterhouse: Dune, and to get it I picked up two books titled Hunters of Dune and Sandworms of Dune. These books are part of what I like to call the “Expanded Dune-iverse” that was written by Brian Herbert, Frank’s son, and Kevin J. Anderson. 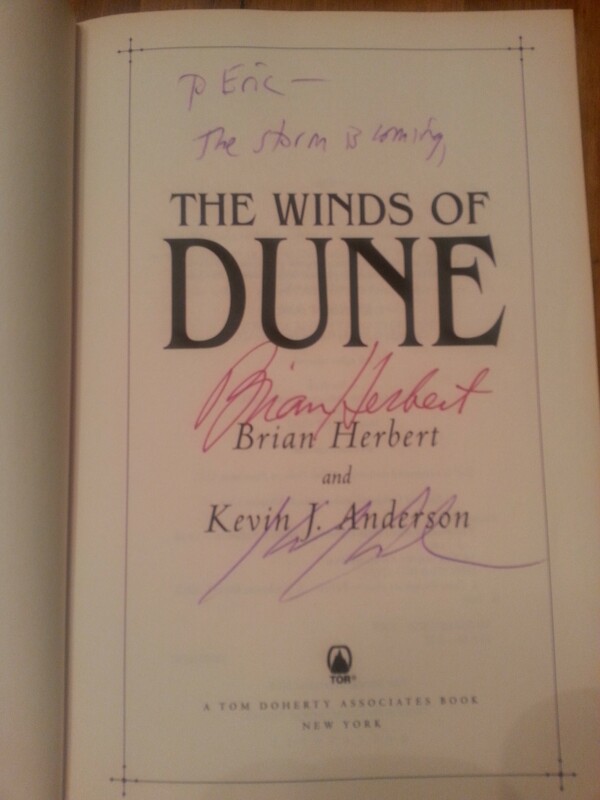 The novels that comprise the expanded Dune-iverse were all based on notes that Frank Herbert left behind. I was fortunate enough to hear the two authors discuss how this all came together a few years back, and it was truly a labor of love. Their dedication to the source material really does pay off and gives their novels a greater sense of purpose and continuity than exists in some other expanded universes (cough Star Wars cough) even if these books don’t quite live up to the original series. I have read all of these novels before, but only once; however, as I mentioned, I wanted more time in the world so I chose to reread Hunters and Sandworms for the first time in years. While the story they tell is exciting and entertaining enough to make the journey fun, the original novels set my expectations quite high and these books are not quite on the same level for me. Without being nitpicky, there are a few key things that contributed to this feeling. Perhaps the thing that most influenced my feelings on these books is the pacing. Where the original series had long, dense chapters the newer books move along much more quickly. Short chapters (often just a few pages) progress the action very rapidly and bounce the reader along between multiple characters and locations more frequently than one might like. As a result of this the places and characters don’t feel as developed as in the originals. It almost feels like the authors rushed to cover a lot of ground and only had time to briefly touch upon certain things to check them off a list in getting to the end. The writing is also not as eloquent as the originals. There were a few elements that came off sounding bad. Stuff like the “Final” Kwisatz Haderach, “ultra” spice, and numerous adjectives consistently attached to the already hyperbolic “struggle at the end of the universe” seemed to overdo things a bit, especially since they are used fairly frequently. The authors also seem to feel the need to remind us of certain plot points ad nauseam. The original series really did a great job creating a distinct atmosphere in each book, in particular one of desperation that over the reader in Heretics of Dune and Chapterhouse, but these expanded books more often tell us how the characters are feeling rather than involve the reader with that feeling. Where the original novels really built up these moods, Hunters and Sandworms are not nearly as subtle. Finally, these books do not really feel like the ending to “Frank Herbert’s Dune” but rather the ending to Brian Herbert and Kevin J. Anderson’s Dune. There is a lot in these books that would only make sense to a reader that has read the two prequel trilogies released prior to these books, and we’re not just talking minor references; two or three HUGE plot elements are derived entirely from those six books and in some places they prioritize the prequel stories over the original material. That is a lot of backstory just to pick up what is supposedly the next book in line following Chapterhouse. I’m not saying they’re way off base from what the seventh Dune novel would have been (they have access to notes I never will), it’s just that the heavy reliance of the prequel materials makes me more consciously think about what would have been, especially given the stylistic discrepancies. More after the break. SPOILERS AND CONCLUSIONS FOLLOW THE BREAK. Here we are with another highly anticipated release by Trillium Brewing Company. This one was brewed for the recent Hop Jam Festival in Vermont but was also available in bottles and growlers at the brewery. It seemed too good to stay away from, so I went out to grab a couple of bottles on release day last week. Description: A juicy Double IPA brewed with Galaxy, Mosaic, and Columbus hops. Pour Info: Refrigerated bottle into a snifter glass. Price: $12 per 750 ml bottle. Pretty much their standard price for this sort of release. Appearance: Pours a cloudy light pale body that is just slightly golden orange. If pushed a half inch foamy white head forms that is quick to dissipate. Smell: Citrus juice and sweet hops. Starts smelling even sweeter as it sits in the glass for a bit. Taste: Bursting with citrus juice and hops. Up front the juice is most apparent; I want to say mango/orange/tangerine dominate here. 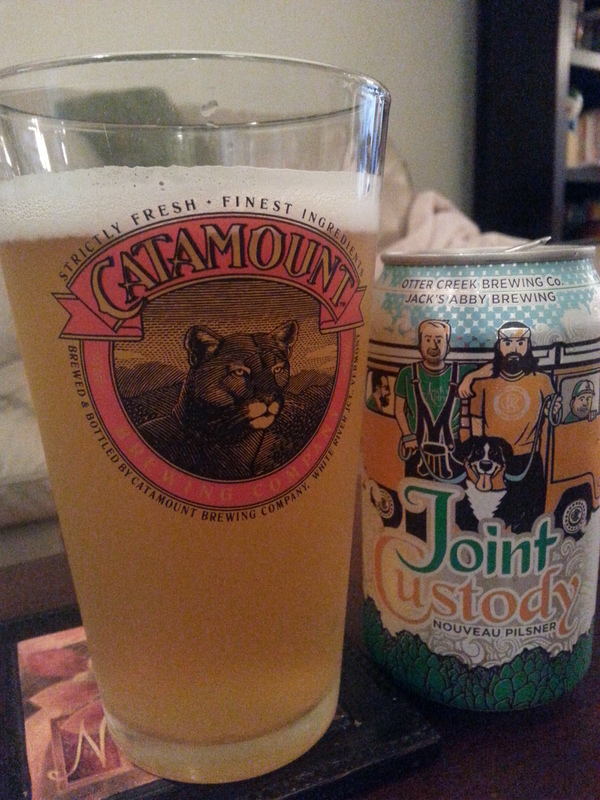 This combines with a very heavy hop presence beginning mid sip that is piney/resiny with an almost spicy finish. Mouth Feel: Medium bodied as appropriate for the style and accompanied with light and happy little bubbles for carbonation. Hype Factor: Another beer where the hype was very high. The line wasn’t quite what it was for Green Street but people definitely came out for this one as well and I had about a half hour wait for bottles on a Friday afternoon. Again, the brewery handled the release quite well and kept the line orderly and moving. Cheers to them. 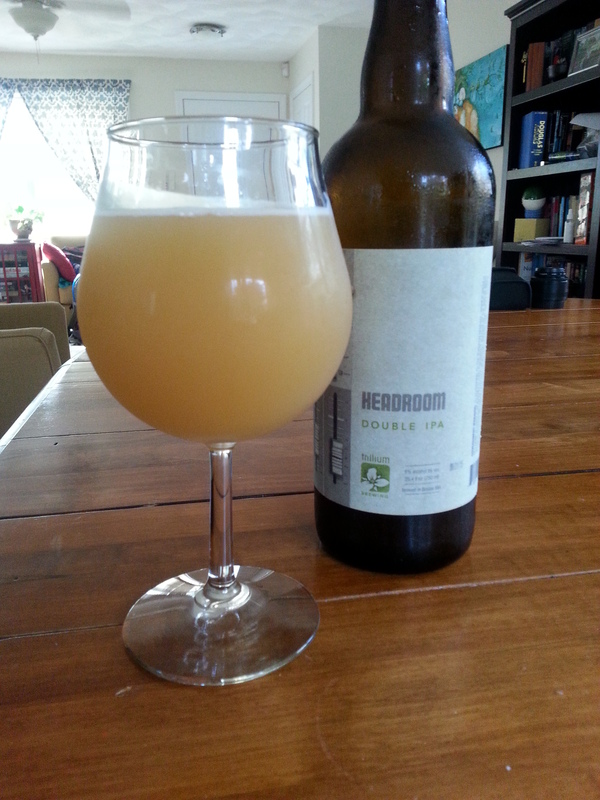 Overall: Another release by Trillium that met the high expectations. It seems like they can’t miss on hoppy offerings these days and this beer continued that streak. What we have here is another world class offering that is highly recommended if you come across it. Oddly enough the next beer up on my list is another collaboration brew, this time between Jack’s Abby in Framingham, MA and Otter Creek in Middlebury, VT. I happened upon these cans after another day of hiking, and they seemed like a safe bet. Brewery: Collaboration between Jack’s Abby and Otter Creek. Description: Described as a “nouveau” pilsner because it is a blend of a traditional German pilsner base coupled with two of Germany’s newest fruity hop varieties, Mandarina Bavaria and Huell Melon. Pour Info: All cans were consumed cold. Some straight out of the can, some poured into a pint glass. At the time of this writing, two were drunk out of the can and two from a pint glass. Price: It was around $11 or $12 for the 6 pack of 12 oz. cans. It was mixed in with other purchases, so I don’t recall exactly. Appearance: Pours a cloudy, darker straw yellow/gold color. Just less than a finger’s worth of foamy white head to start things off. Smell: Fruits up front, mostly tangerine from the Mandarina Bavaria hops and a slight hint of bitterness at the end. Taste: Here is where things get really interesting. First from the pint glass, the beer has a juicy melon/tangerine opening backed up by a slightly grassy and piney hop finish. There is also a distinct crisp maltiness that picks up in the late middle of the beer. All things considered, I get more of a Pale Ale (rather Pale Lager since this is a Jack’s Abby creation) feel out of this than a Pilsner. Drunk out of the can, the beer has largely the same tastes with one key difference: a strong smoky taste that picks up right about where I noticed the malts in the poured version. It is not entirely off putting, but very unexpected. Only once out of the glass did I get any hint of this and that was from a final sip I had left sitting around close to room temperature. Guesses/explanations I have seen range from a trick of the tastes buds to phenolic flavors imparted by some part of the yeast or malt bill. I won’t hazard a guess, but it did taste much better from the glass because of this. Mouth Feel: Lighter side of medium body and moderate carbonation. Very easy drinking. Hype Factor: Moderate. I was excited to see it in the store and Jack’s Abby is a favorite of mine, but I had no special hopes for it. Overall: When consumed from a glass, I really like this beer. It was very flavorful and easy drinking– perfect for drinking outside at the end of a tiring summer day. Out of the can it was not quite as good but not bad. This being said, I think the one six pack was enough. I’ve had better from each of these breweries. 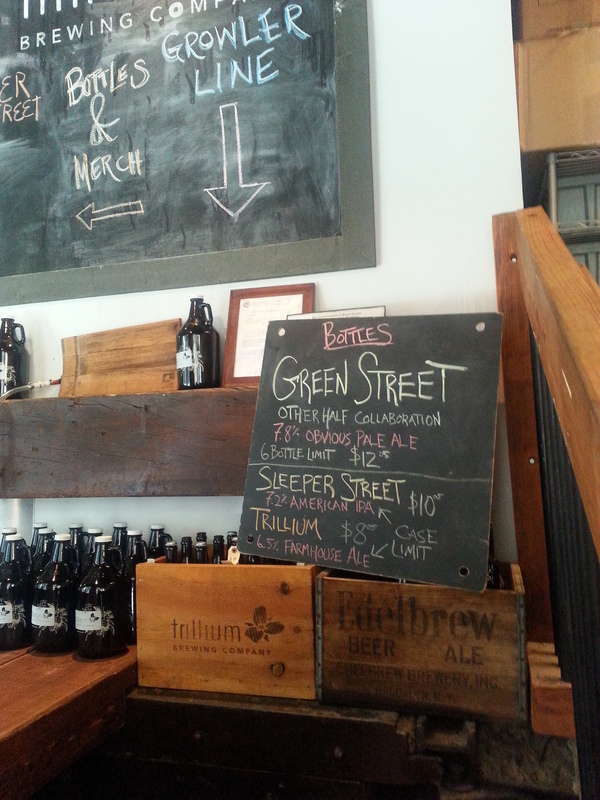 Green Street: Trillium and Other Half Collaboration IPA! I have a confession to make. I’ve never lined up at a brewery to get hold of a special or limited release–today changed all that. 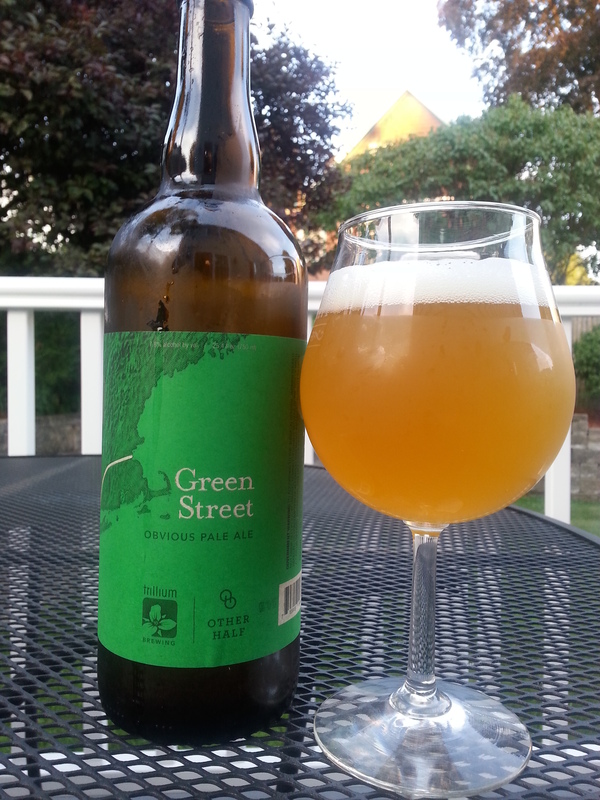 I took advantage of a beautiful day in Boston and used my lunch break to head on over to the Trillium Brewing Company to grab some bottles of their newest creation, Green Street, Obvious Pale Ale brewed in collaboration with New York’s Other Half Brewing Company (whom you may remember as one of my standouts from this year’s Extreme Beer Fest). I got to the brewery, or at least the general vicinity of the brewery, about 10-15 minutes before their noon opening and saw that about 100 fellow beer enthusiasts had already lined up. I dutifully took my place in line and at least that many more steadily queued up behind me in short order. I had anticipated a line but perhaps not quite one stretching around the block. Luckily, work was slow, the weather was fantastic, and everyone was in good spirits. I honestly didn’t know what to expect from people lining up for beer on a Monday morning, but everyone in my little area was patient and friendly. The crew working there did a fantastic job of getting people in and out efficiently and orderly. I got in about 45 minutes after opening. Doing bottles only from 12-4 was an excellent call as having all hands on deck for bottles sales really kept things moving. I am curious about how the growlers moved this afternoon but wasn’t curious enough to get in line for it knowing how long fills can take and imagining what that line would be like. I grabbed my 6 bottle limit and got out of there. Brewery: Collaboration between Boston’s Trillium Brewing Company and Brooklyn’s Other Half Brewing Company. Style: Despite the name, it seems to be classified as an IPA. Description: IPA created from Valley Danko Rye malts and double dry hopped with Simcoe, El Dorado, and Azaca hops. Pour Info: Refrigerated bottle into the snifter. Price: $12 per 750 ml bottle, which is the going price for their dry hopped offerings. Considering the limited quantities of this beer and all the buzz surrounding it, I was quite happy with this. Appearance: Pours a golden orangish-yellow body with about a finger of foamy white head that gradually subsides to lacing across the top and sides. Smell: Burst of tropical fruit and a slight floral aroma. You can smell the juiciness to come. Taste: As expected, lots of juicy tropical fruit up front that blends into a very similar juicy hoppy bitterness. The hop profile turns a bit piney at the finish that lingers a bit after the sip is finished. At warmer temperatures the rye malts also come out a bit at the end, nicely complementing the piney Simcoe hops. Mouth Feel: Medium bodied and almost reminiscent of juice. Carbonation is also medium, perfect for the style, and happily bubbly. Hype Factor: Very high. Did I mention the line? Overall: This is a damned good beer. Very comparable to the Double Dry Hopped Fort Point Pale Ale (DDHFPPA for all you cool kids out there) I picked up a growler of last week. The key difference here is that where that one was more citrusy, this one is more tropical. I definitely taste Trillium’s influence on the beer and would rate this up among the best offerings I have had from either brewery. Very happy I got to try this. Was it worth waiting in line an hour for? That’s a matter of opinion considering the comparable options Trillium spoils us with on a weekly basis, but I certainly don’t regret having done so. This time around we’re checking in on another local brewery I haven’t touched upon here yet. Clown Shoes is a contract brewery currently brewed out of the Mercury Brewing Company facilities in Ipswich, MA. Distinguishable by their distinctive logo and variety of styles, they see a fairly wide distribution and have had some notable hits (Photosphere Phil, Undead Party Crasher) and equally notable misses (Ghengis Pecan Porter) for me. However, after doing some hiking last weekend, I happened into a store where the resident beer guy was recommending their new summer beer, Mango. I was willing to give it a go and share the results with you all below. Description: Described as a traditional German-style Kolsch “bastardized” with the addition of dry-hopping and mangoes. Pour Info: Poured from a refrigerated bottle in a trusty snifter glass. Price: $5.49 for a 22 oz. bomber. Definitely intriguing price point. Appearance: The bottle opened with a distinctive hiss and produced a lively, thick bubbly head that ultimately settled down to about about a finger in height. The body of the beer was a light and golden straw color. Smell:. Slightly yeasty with hints of sweet mango juice. Taste: Interesting. The first pour had a strong bitter, yeasty taste up front. Mangos came through at the end though not quite as much as I would have hoped for nor enough to really stand up to the bitterness upfront. The bitterness did fade and the juiciness picked up a bit as the beer warmed. Dry finish. For the second pour, the beer was a bit more balanced overall with slightly less bitterness and slightly more mango. It was also bit crisper and smoother to drink this pour as well. Mouth Feel: Medium bodied and medium plus carbonation. Hype Factor: As noted, it came highly recommended by the staff so expectations were somewhat elevated. Overall: I liked this beer, but I did not love this beer. It was certainly refreshing after a day’s worth of hiking though. Admittedly, Kolsch beers aren’t exactly my go to style but I think I got out of this about what I expected to. I wouldn’t recommend going out of my way to try this, but if you happen to be in the mood and see it on draft or in a bottle you could do much worse for a summer oriented beer. 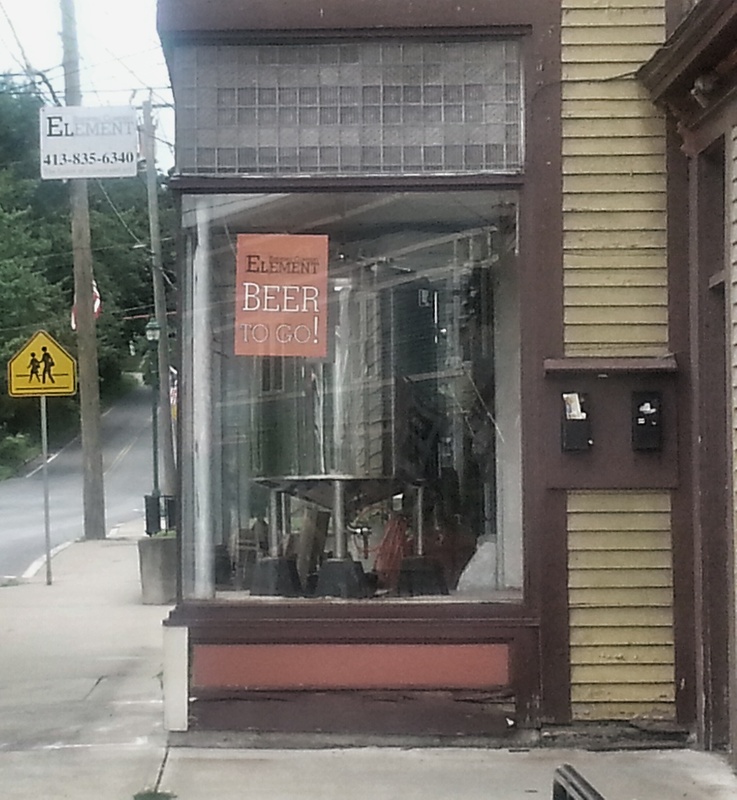 On the way home from our weekend hiking expedition, my wife and I stopped by the Element Brewing Company in Millers Falls, MA. I’ve had a big hit and an equally big miss with their beers on here, but there was no way we were going to pass up stopping by here since they were directly on our way home and have a special place in our hearts due to their gluten free offerings. It was apparently meant to be. The brewery is located at an intersection in a quiet corner of town, though I suspect that description likely describes most corners of Millers Falls. You walk into a shop area where they have merchandise and bottles for sale. Beyond that out of sight is the brewing area in the back, which you can also peek at from the street. Most important for purposes here, there are a few barstools set up in a tasting area in the back corner of the shop where you can get small samples of some of the brewery’s core offerings and order growler fills. There were four samples pouring the day we came in. Starting things off was Extra Special Oak. This is something I’d been interested in trying despite my disappointment in the lavender version earlier this year. While I did like this version of their Strong Ale more, it still quite wasn’t my thing. I think is largely due to a huge oak taste that takes over the beer almost from the start. There are some nice hints of vanilla and sweet malts going on in here somewhere, and the beer does have a nice mouthfeel going down, it’s just too dominated by oak for my tastes. Sample number two was Red Giant, an intriguing middle ground between a more traditional Amber Ale and a Red IPA. This one I really enjoyed. The hop presences is only mild to moderate but yet it somehow it manages to stand out. There are also some good caramel malts going on in here with a few other intricacies I couldn’t quite put my finger in the sample I had. I did bring home a bottle for more research, so hopefully I will be able to track those elusive tastes down. Up next was Dark Element, another beer that didn’t quite fit nicely into a single category. It poured like a typical black ale but the taste was simultaneously a little bit malty, a little bit sweet, and a little bit hoppy. It was very smooth and easy to drink. I’d come across this before at beer festivals but don’t think I really appreciated the subtleties of its taste before. Another very nice beer. 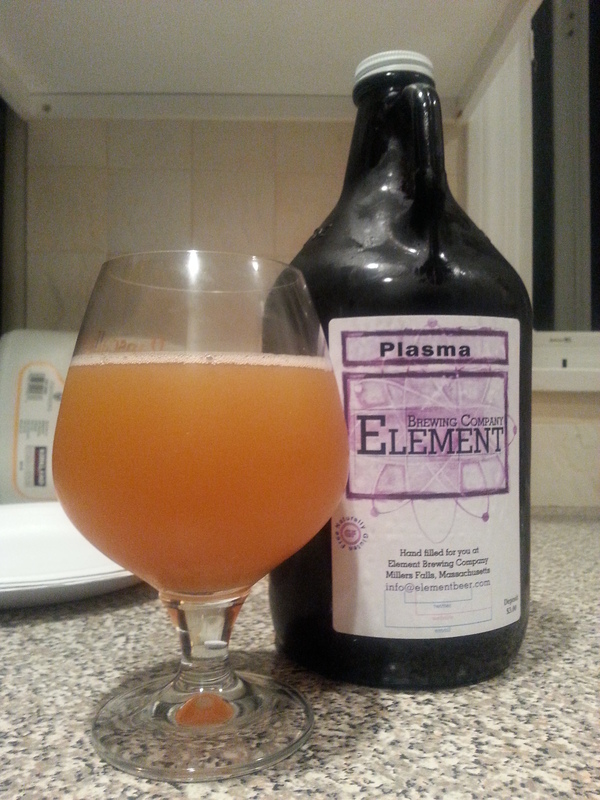 Last up was the Plasma IPA. It is billed as Saki IPA and is certified gluten free. This is one of my wife’s favorites and she was excited to be able to try it at the source. At 9.3% ABV, this beer is an absolute monster amongst the field of gluten free beers out there, but it is also decidedly one of the best and something that even drinkers without gluten sensitivities should try out. It has an assertive resiny/citrus hop profile upfront that stands out in a good way, like it should in a hop forward DIPA. The finish is bubbly with a nice dry, rice alcohol flavor that really does bring to mind drinking saki. Needless to say, we came home with a growler of this. The night before at the People’s Pint, we also tried out Tachyon, their other saki IPA, that at 5.2% this pretty much a smaller version of Plasma. The hops aren’t quite as intense but the dry saki finish was still there. The verdict on this was that it was also good, but not quite as good as its bigger brother. I only got a sip of this one but am inclined to agree. It does have a friendly $5 per 500 ml bottle though. All in all, we were very happy we stopped by this brewery on our way home. They had some really unique and interesting beers to offer, to say nothing of them being one of the few places putting out really solid gluten free options. I was seriously considering picking up some more of their limited series bottles while I was there, but at $15-$25 for some of them they were just a bit too pricy for my current circumstances. With the exception of the Extra Special Oak (which I might have seen coming in retrospect)I really did like everything I tried from them this weekend and was quite pleased with the purchases we made. The server was super nice, laid back, and informative on a variety of topics ranging from the certification process for brewing gluten free beer, the local wild goat population, and colonial era massacres. To get all that and be able to share a (good!) beer with my gluten free wife? Awesome. Very cool way to end our weekend journey. Our latest hiking adventure took us out to the western part of Massachusetts in the neighborhood of South Deerfield. After a full day of hiking, including a missed turn that transformed a three mile walk into an eight mile journey, my wife and I checked into the tree house where we would be staying that night (yes, really) and then went off in search of dinner and a much needed adult beverage. 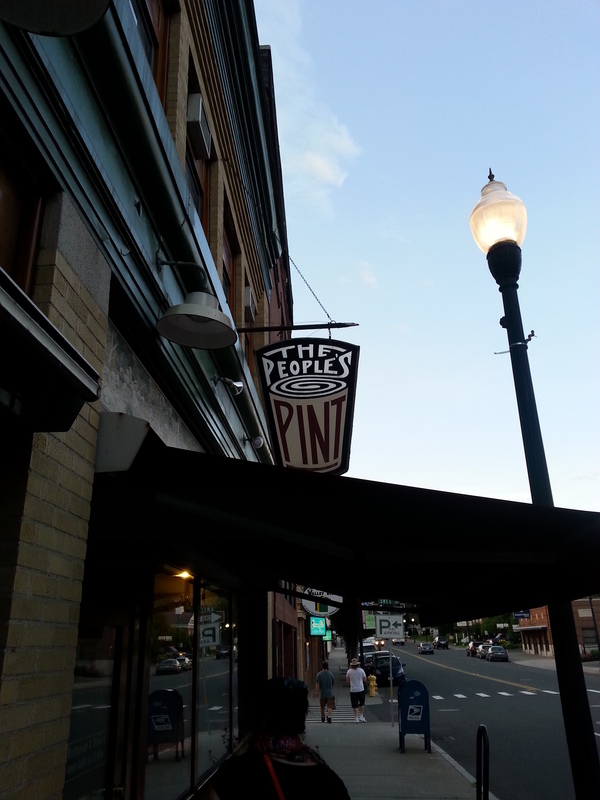 The People’s Pint Restaurant and Brewery in neighboring Greenfield was the place I had my eye on from the start of the trip and that is where we ended up. The restaurant is located in the downtown area of Greenfield which was surprisingly larger and more lively than anticipated. I wouldn’t quite call it city-like, but it was certainly more built up than the surrounding towns. The restaurant’s storefront is is fairly unassuming, but inside the place is quite nice and spacious. There is a large bar area off to the right and straight back from the entrance is the main seating area. We arrived around 7:30 PM on a Friday night and the place was pretty full, which is usually a pretty good sign. 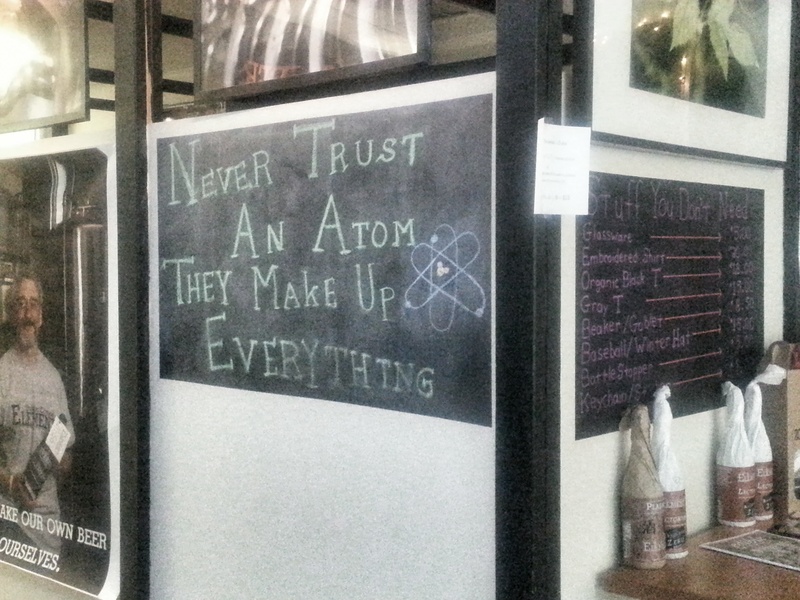 During our short wait to be seated, I passed the time by examining the draft listing up on their chalkboard. There were 12 house offerings available that day in a variety of styles. Of particular interest to my wife, one of these offerings was a gluten reduced beer named Hoverboard. They also featured in bottles the ubiquitous gluten reduced Omission IPA and more notably a couple of certified gluten free beer from nearby Element Brewing Company. It is not often that brew pubs or beer establishments have gluten free options like this (wine was also available), so they were definitely appreciated. After our long day of hiking though, food was decidedly the first order of business. To our pleasant surprise, their menu was also friendly to people with gluten sensitivities as they used corn tortillas in their tacos and offered a gluten free bun option for their burgers (that my wife says are legitimately good as opposed to some other gluten free substitutes she’s come across). For dinner, we both decided upon the Squealer burger and we could not have been happier with that decision. I don’t know how much the hunger following an unexpected eight mile hike was a factor, but this is easily one of the best burgers I have ever had in my life, and I’m a guy that likes his burgers. Made with grass fed beef mixed with bacon and served with a chipotle mayo and fixing of your choice, we both absolutely loved this. If you’re here and thinking about making this your order, stop thinking about it and do it! It was that good. But anyways, back to beer. Once I had a handle on the food situation, I started the evening off with what they call the classic flight consisting of the Natural Blonde Ale, Hope Street Amber, Pied Piper IPA, and Farmer Brown Ale. The Natural Blonde Ale was light and refreshing with a slightly sweet malt finish. It had a nice clean taste and was well executed. The Hope Street Amber was a solid ESB with a similar malty sweet profile paired with a slight hop presence. Next up was the Pied Piper IPA. It is a more balanced IPA, with floral and citrus hops complimenting caramel malts. As I’ve mentioned before on here, this is a flavor profile I really enjoy, if this had a little more hoppiness to it I would have been an even bigger fan. Rounding out the flight was the Farmer Brown Ale. It had a nice light caramel and chocolate malt finish and drank very smoothly. As a bonus for me, it didn’t have a pronounced bitter roastiness that often turns me off of brown ales. For my next flight I mixed things up a bit and ordered the Super Session, Training Wheels, Our Oatmeal Stout, and Forty to One Maple Brown. As you can probably guess, Super Session was a session IPA clocking in at a mere 3% ABV. Despite this, it was very flavorful and refreshing with a big juicy hop presence that didn’t completely overwhelm the beer. Training Wheels was another session IPA (go easy on me, it had been a long day) with a 4.5% ABV. It had more of a piney hop profile and again was well done. I think Super Session wins this matchup though. For something completely different, Our Oatmeal Stout came up next. This was another solid offering with a nice smooth mouthfeel a great malt presence. The final beer of the night was the Forty to One Maple Brown, which, per the brewery’s descriptions, was named in reference to the amount of sap needed to produce maple syrup. I really liked this one. It had a nice maple taste paired with a hint of caramel sweetness and a good mouthfeel. So what’s the verdict on The People’s Pint? I liked it and wouldn’t hesitate to go back. While none of the beers really stood out as outstanding, I do think they were all well made and good examples of the styles they intended to create. It’s easy to be spoiled by only chasing world class rated brews, but it’s also nice to sit down at a local town brewery, drink some good beer, and see what the place is about. If I had to pick favorites, I would go with Pied Piper, Super Session, and Forty to One. It also doesn’t hurt that they had some awesome food, decent prices, and plenty of options for my gluten-sensitive wife. It was a great combination that made us both happy. If you’re in the area check them out, and don’t forget to order the Squealer burger!